What do you want to bring that up for? Martha was miffed. Let it lie, she thought. It’s not how it was anyway. See, saw, one way then another. It’s all a matter of perspective. Chop it and place it this way or the other, it’s just stories on paper. Does it still carry the history from the rings of the trees? Or from the roots feeding on long past imaginings? Fossils fuelling nuggets of truths. Depends on how you remember it. Martha came back into the house and took off her rain coat. With a sigh she put down her pen, notebook and binoculars and sat quietly in the corner. Already Read Series 3 2008. Tracey Falcon. Newspaper. 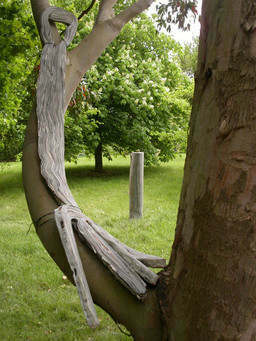 part weathered – the ‘fork’ was installed on a tree at Art in the Garden at Sir Harold Hillier Gardens May-October 2007.